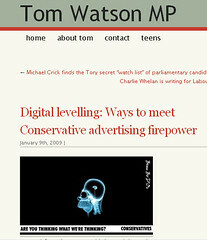 Tom Watson, the member for West Bromwich East and Civil Service Minister, is a rare politician: he gets the web. And I don’t mean just as a campaign broadcast tool (viz Obama). He gets it as a utility and a potential agent of change and engagement. In recent weeks, this has become more important. With the government making specious announcements regarding regulating web content with cinema style ratings and attempts to record (if not monitor) emails, more than ever before we need folks at the top tables of government who understand this internet thing. Tom Watson has been on my radar for a while as an example of an MP who has a great blog (one of my other favourites is the more anarchic Paul Flynn). His deft hosting of a comment thread about web content ratings was as good as I’ve seen from even experienced community managers (and that’s meant as a compliment). But what was really classy was how he then compiled the thread into a report for the relevant minister. The more I think about having an MP and minister soliciting comment online and then feeding that through to the relevant decision-maker, the more brilliant I think it is. Plenty of politicians use the net as a ‘broadcast’ medium, so it’s great to see an MP who is seeking collaboration and exchanges. Follow him on Twitter: he’s ace. It’s unrealistic (and also unattractive) to expect every minister or MP to participate online but we need more like Tom Watson. What we get from him is authenticity. Webcameron, staged YouTube videos however informal and faux Facebook groups are all very well and a good step but we need more genuine, meaningful participation by the member/candidate/representative. Tom Watson is leading by example and the unofficial minister for geeks.